Hi and happy Thursday - I hope you're all tip top today! 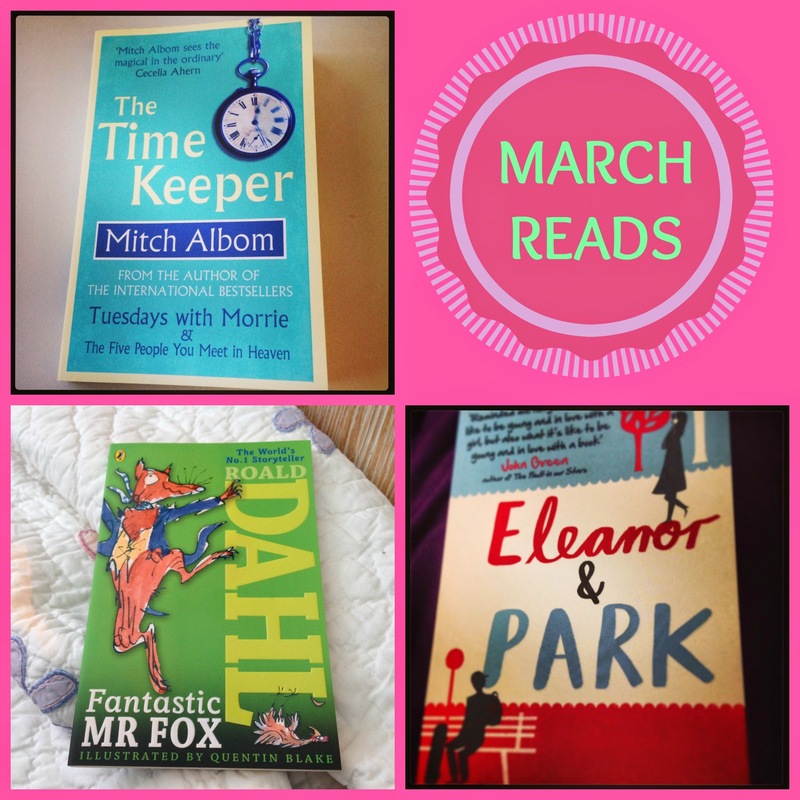 It's the start of a new month so let's get started on my march reads... So first off I'm going to completely ignore the fact that my Goodreads 2014 challenge is going dreadfully. I can't bear the fact that I've fallen so far behind, but I'm hopeful that my upcoming week away (HOORAY!!!!) will allow me to catch up. Here's hoping! Anyway let's dive straight in and look back at the brilliant books I read in March. It's definitely been a good month for books, my reading jar has brought with it some brilliant picks! I've been meaning to devour a book by Rainbow Rowell for ages as I'd heard such awesome stuff and knew I'd enjoy them but I just hadn't gotten round to it. So I was so pleased the name of this book came out of the hat at the start if the month. It's such a great read and I couldn't help but fall in love with Eleanor and Park. They were just so adorable and their relationship was so beautifully written. Rowell wonderfully captured their teen voices and I enjoyed the slow build of their relationship in all it's awkwardness. I am most definitely a Rainbow Rowell fan now, I just need to get hold of more of her books. Any suggestions on which I should read next? It's been a long while since I've read a book by Mitch Albom, which is ridiculous as I loved both Five People You Meet in Heaven and Tuesdays with Morrie so so much. This book really reminded me why I love his writing as he has a way of getting you to question things you've never really thought about, big things like time and yet it's not hard work. You can read it, and I did, in less than two hours. The Time Keeper wasn't better than Albom's previous books but it wasn't far off. It was wonderfully written, got me thinking and was thoroughly original. The Cuckoo's Calling has been on my TBR pile for ages and ages, even before J K Rowling was 'outed' as the author so I'm glad I finally read it this month. If I'm honest I can't say I was hooked straightaway instead it took a hundred or so pages for me to be intrigued, but as soon as I was I devoured the book. I really liked the two protagonists in the book, I loved that everything was so straightforward for Robin and that Strike was a more complex character. They played off each other really well. Another think I enjoyed with this book was that whilst you knew who the murderer was fairly early on, it didn't stop you racing toward the end of the book to find out why, how and generally all the answers! I'd definitely recommend this book to any fans of detective stories. My final book from March was Fantastic Mr Fox which I'm ashamed to say I never read as a child, clearly I missed out. It was funny, cheeky and a fantastic tale (excuse the pun!). Definitely a good introduction to the wonder of Dahl and a book I will no doubt read when I need cheering up! Also as perusal the illustrations were beautiful. So that's my month of reading but what about yours, what awesome things have you been reading lately?